Do you want to spend this holiday with your friends and family? Do you like to have a great adventure for this vacation? Choosing your favorite dive sites is a great way to enjoy a good time and to have a real adventure. When you like to look at the wrecks, sealife, underwater scenery, drift dives or big stuff, below are the best destinations on that could make your holiday a real adventure. This article covers Top 5 most popular diving places you would love to visit during your vacation. There are plenty of sites you would like to see but they give you a lot of surprises so below are the top destination that helps you get the best entertainment. The Barracuda Point is one of the famous places in the world for diving where sharks come cruising and surround you. In fact, you are quite guaranteed to see the biggest stuff here. The strong current would blast the underwater prairie and white tips turtles, jacks, grouper, bumphead parrotfish and of course barracuda. The Thistlegorm, Egyptian Red Sea holds quite a large dive that brings efficient entertainment for you to get a quality time here. In 1941 The Thistlegorm (Blue Thistle), a British vessel carrying a cargo of war supplies that includes rifles, train carriages, motor bikes and trucks was attacked from the air then sunk. Here, the current could be too strong and at the different directions at surface the wreck. The Yongala is the shipwreck off the coast of Queensland Australia. The Yongala, Australia is one of the Best Diving Place for you to easily enjoy a good time in most excellent manner. The Yongala, Australia is the finest diving spot with manta rays, octopuses, turtles, sea snakes, bull sharks, clouds of fish, tiger sharks, spectacular coral and much more. In 1911, The Yongala sank and killed 122 people during a cyclone. The Yongala has no telegraph facilities so that there are no options to alert about the weather ahead. The Yongala was given official protection under the Historic Shipwrecks Act in 1981. The Yongala is located at about 10 km away from Cape Bowling Green and 90 km southeast of Townsville. Manta Ray Night Dive at Hawaii attracts most people with its underwater lights on the ocean floor. Infinite amounts of plankton and beautiful manta rays of Kona Hawaii gets attracted by the underwater lights so it would be a great sight for you to enjoy viewing them. Manta Ray could get so close to you and often you need to often avoid accidentally hitting them. Get the unforgettable and wonderful time with beautiful sea animals in the world. 70% of our world consists of water so why explore 30%? For this holiday reach out to your favorite destination and dive to see more of the world. Discovering underwater world truly incredible experience with complete different from earth. According to a recent estimation, there are more than 230.000 species discovered under the sea and it is much more expected that 80% of species in the ocean of the world remain undiscovered. 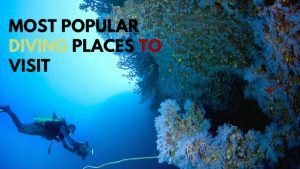 Enjoy the beauty of the world and share your experiences about these Top 5 most popular diving places of the world. Chelsea Nguyen is working as a Manager and blogger at “Paradise In Fiji” which is one of the best vacation spots in Fiji. She has been writing for several years about the https://www.paradiseinfiji.com and other attractive spots. She is having great knowledge about it.